Who are Workplace Health Without Borders? 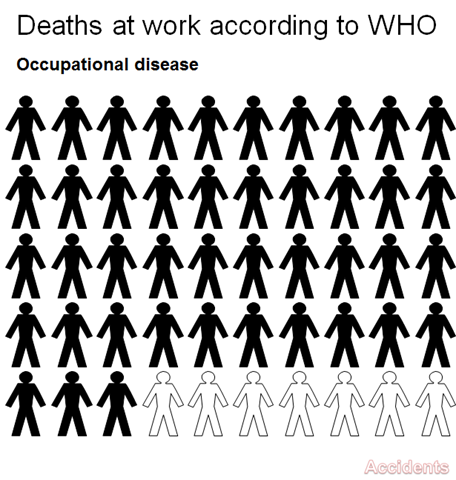 Workplace Health Without Borders (WHWB) is an organisation of occupational hygienists and other occupational health professionals who want to do something about the estimated 2 million people who die every year due to ill health caused by their work, and the countless millions of workers who suffer from work related illnesses. WHWB was established in Canada in 2011 and now has members in countries across the world. 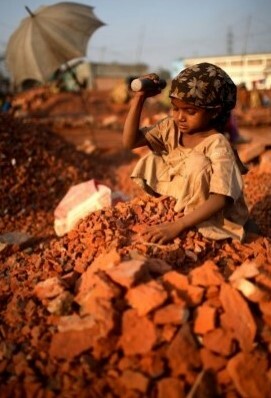 The organisation’s stated mission is to work for a world where none is made ill by their work. A grand aim which will be far from easy to achieve. But WHWB are doing their part in trying to achieve it by working to transfer occupational hygiene expertise, training and resources to developing countries to help them to develop the capacity and local infrastructure to manage and improve health conditions in their workplaces. WHWB also organise monthly teleconferences for their members across the globe to share knowledge and experience. WHWB members attending the recent International Occupational Hygiene Association conference organised a lunchtime meeting to introduce interested delegates to the organisation, its aims, objectives, activities and projects. Over 50 delegates attended the meeting and there was a lot of enthusiasm for what WHWB are doing. 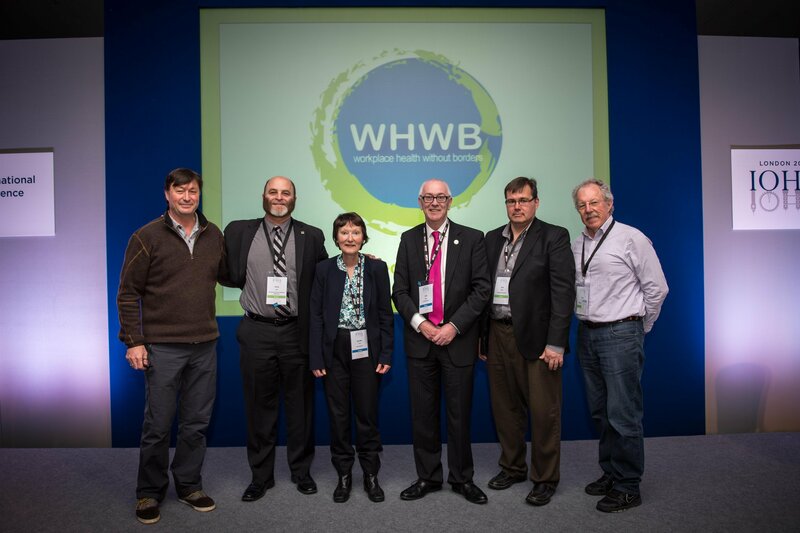 WHWB co-sponsored the 7th International Control Banding Workshop in partnership with Medgate, which took place at the Conference, and there were also contributions from two WHWB members to the Conference programme. Kevin Hedges from Canada gave an Ignite presentation – Workplace Health Without Borders, Together We Will Make A Difference! – and Dave Zalk from the USA presented a scientific poster entitled Workplace Health Without Borders: Sharing occupational health and hygiene knowledge around the world. On the evening of 28 April, Workers’ Memorial Day, the Breathe Freely initiative, which aims to raise awareness of respiratory disease in the construction industry, was launched at a reception at the Merchant Taylor’s Hall in London. 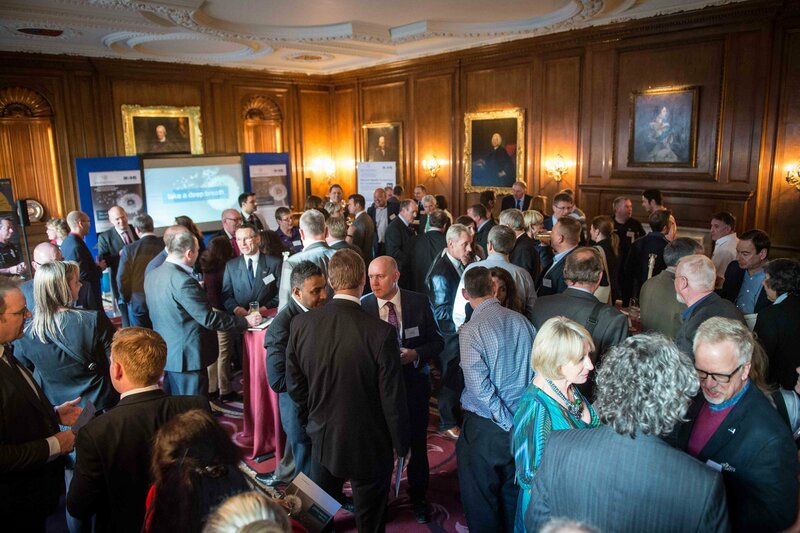 The room was packed with 140 people, mainly representatives from the Construction industry. Breathe Freely is a collaborative initiative led by BOHS in partnership with key organisations within the construction industry. It will provide guidance, tools and resources that facilitate the recognition, evaluation and control of workplace exposures leading to the implementation of a recognised management standard. The aim is not just to raise awareness of the problem but also to effect action by providing practical solutions through sharing of best practice and encouraging implementation of effective exposure control. 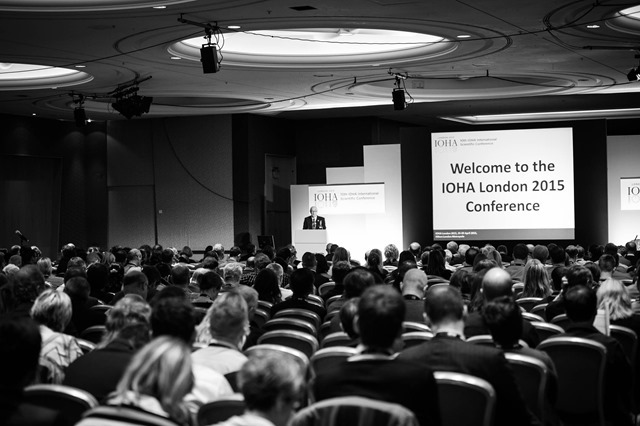 A couple of weeks ago I was in London attending the 10th International Scientific Conference of the International Occupational Hygiene Association (IOHA) organised by the British Occupational Hygiene Society (BOHS). The conference was held in lieu of he usual annual BOHS Conference that normally takes place that time of the year. It was a step upwards with double the number of delegates who came to London from all parts of the world. It was a packed programme with sessions starting most days at 8 a.m. and not finishing until well after 6 p.m. The organisers also managed to schedule in three technical tours – behind the scenes at the National History Museum, the London Tube and Tower Bridge -which proved to be very popular. With parallel sessions taking place for most of the conference it was impossible to see everything. But sessions I attended and enjoyed included the workshop on noise control, the sessions on risk communication, construction, career development, the presentation by the IOHA award winner, Noel Tressidor (he only occupational hygienists to tour with the Beatles! ), and the highly entertaining (as usual!) Ignite session. 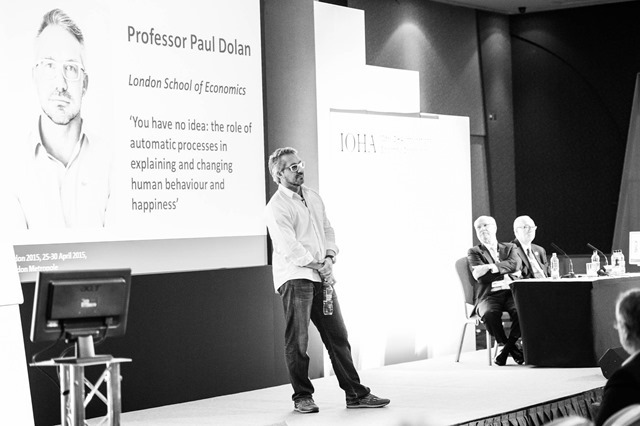 Highlights for me included the Keynote presentations by Professor Paul Dolan and Professor Sir David Spiegelhalter, who were both, in different ways, very entertaining and brought us different, non-occupational hygiene, perspectives. They made me think about how some of the concepts and ideas they told us about could be applied to the practice of preventing ill-health at work. That isn’t to say that the other keynote speakers from fields more closely linked to occupational hygiene weren’t good! They were all of a high standard and brought us up to date on some key issues in toxicology, risk communication and risk management in practice. 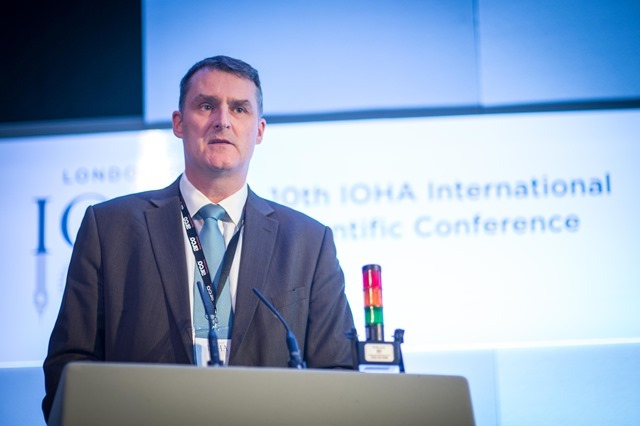 Similarly the scientific sessions and workshops allowed delegates to hear about some important developments in the field and discuss ideas on how to take the science and practice of occupational hygiene forward in the 21st Century. 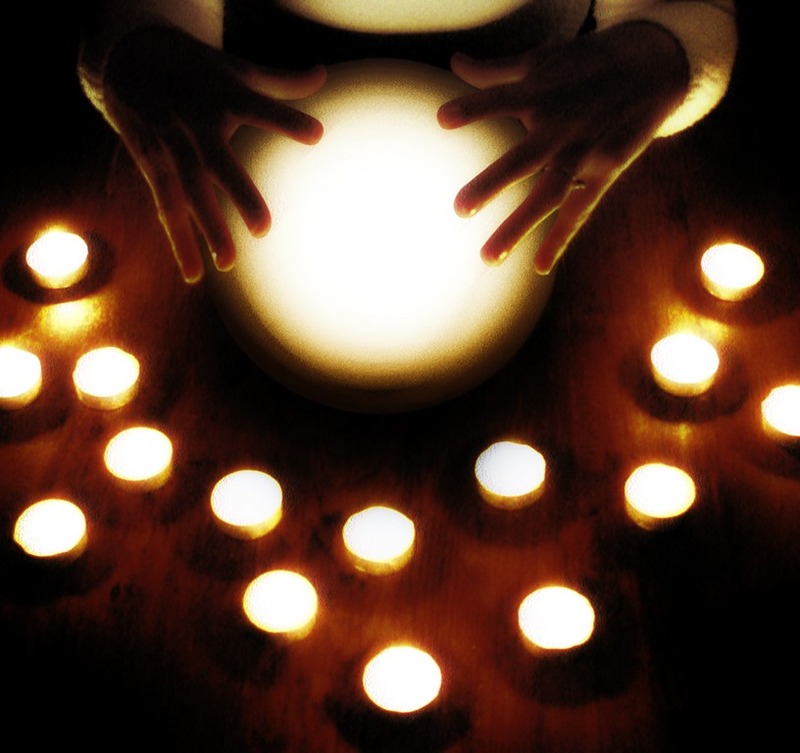 But I think it is also important to look beyond the boundaries of our own domain. We can learn from psychologists, economists, experts in communication and others to give us new ideas and help us to develop fresh approaches. On the Tuesday night the BOHS also launched their initiative aimed at increasing awareness and reducing respiratory disease in the construction industry and to tie in with that there was an excellent Keynote by Steve Hails, the Director of heath and safety for the Crossrail project. Although learning from the formal sessions is important, so are the informal discussions that take place outside during the breaks, mealtimes and socials and other “free time”. Conferences are a great opportunity for networking – to meet old friends and make new connections. The social side of the conference was excellent too. With receptions hosted by sponsors on both the Monday and Tuesday evenings. Plus the Monopoly themed Conference Dinner on the Wednesday – with a fun casino, photo booth and karaoke band to prove that occupational hygienists can relax and enjoy themselves too! It was an educational, enjoyable but exhausting four days. It took me several days to recover! There are relatively few good songs about work, even though it’s a major part of most people’s lives. This song, by the Magnolia Electric Company, is one of them and probably sums up the experience of many shift workers. Shift work can make it difficult to socialise, affect personal relationships and seriously disrupt family life. Shift work can also have an effect on health. Research has shown that shifts, particularly night and early morning shifts, can have undesirable consequences for workers including disruption of the internal body clock, sleeping difficulties and fatigue. These in turn can affect performance, increase the likelihood of errors and accidents at work and might affect health and well-being. Longer term effects, which are more difficult to confirm, may include adverse pregnancy outcomes, coronary heart disease, gastrointestinal disturbances. Recent research has also suggested that shift workers are at higher risk of developing cancer. In particular, there is evidence from four studies of a link between breast cancer and shift work for female workers. Although there remains some doubt about this link the evidence was strong enough for the International Agency for Research on Cancer to conclude that “shift work that involves circadian disruption is probably carcinogenic to humans” in 2007. The reason for a link may not appear to be obvious at first but it has been suggested that altered light exposure at night on levels of melatonin or other hormones may be responsible. Whatever the possible cause, if shift work is associated with breast cancer in women it isn’t going to be easy to eliminate or control. The top of the hierarchy of control is elimination – removing workers from the exposure that causes the disease. But banning women from night shift work would be highly controversial. More work would be needed to understand the causative factors so that other approaches to control can be developed. The association between shift work and cancer hasn’t been proven conclusively yet. More work is needed. But, in any case further work is needed to develop appropriate control strategies to mitigate the known and probable effects of shift work on health. Many people when they get to a certain age start to wonder where they came from. That was certainly true for me so a few years ago I started to research my family tree. Although there were a few surprises my research confirmed that I my family were ordinary workers. I wanted to find out about my roots, about my ancestors, where they came from and how they lived. And as an occupational hygienist I couldn’t help but be interested in what they did for a living and their working conditions. 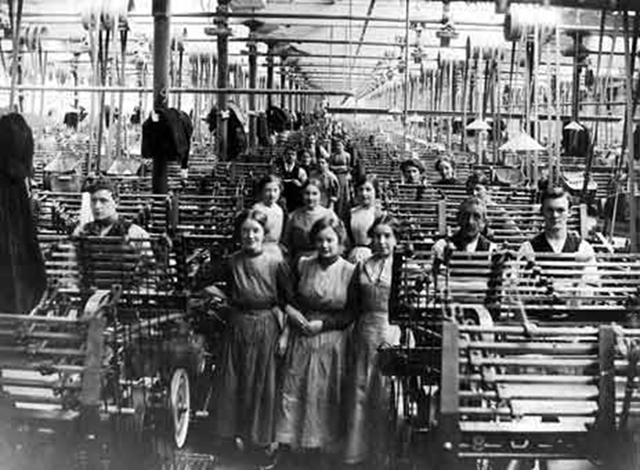 Coming from Lancashire it wasn’t a surprise to find that many of my ancestors who lived in the 19th and 20th Centuries were employed at some time during their lives in cotton mills. 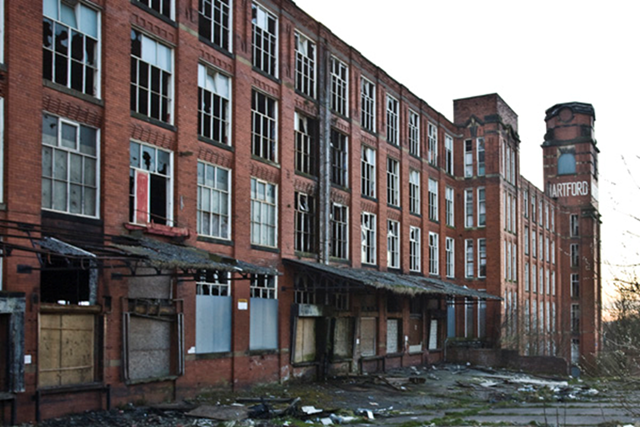 And working in cotton mills they were faced with a whole host of health risks. 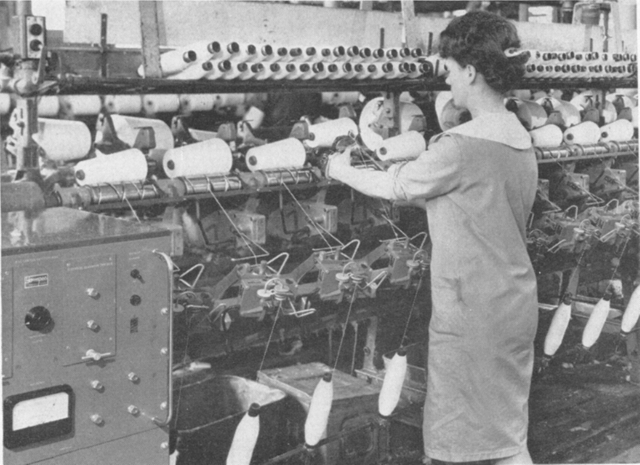 Not surprisingly many cotton workers developed noise induced hearing loss – one study in 1927 suggested that at least 27% of cotton workers in Lancashire suffered some degree of deafness. Personally, I think that’s an underestimation. This is how the term “cloth ears” entered the language – it was well known that workers in the mills were hard of hearing. 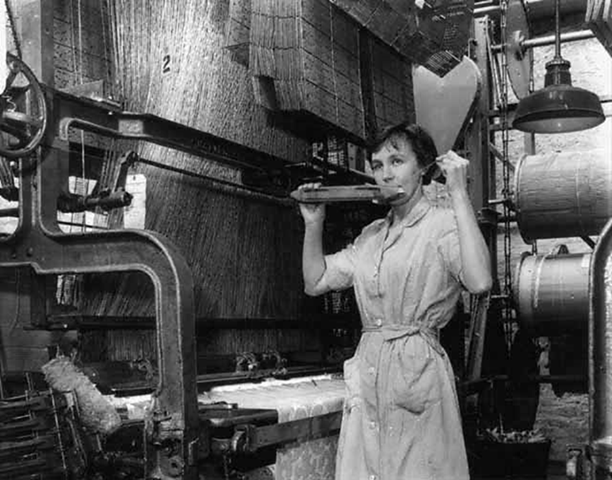 This lady is a weaver and is kissing the shuttle – sucking the thread through to load the shuttle ready for weaving. This practice presented a number of health risks – the transmission of infectious diseases, such as TB, but as the shuttle would be contaminated with oil, and the oils used then were unrefined mineral oil – there was a risk of developing cancer of the mouth. Exposure to oil occurred in other ways particularly for workers who had direct contact with machinery or where splashing of oil could occur. There was a high incidence of scrotal cancer in men who operated mule spinners – and this was a problem even in the 1920s. 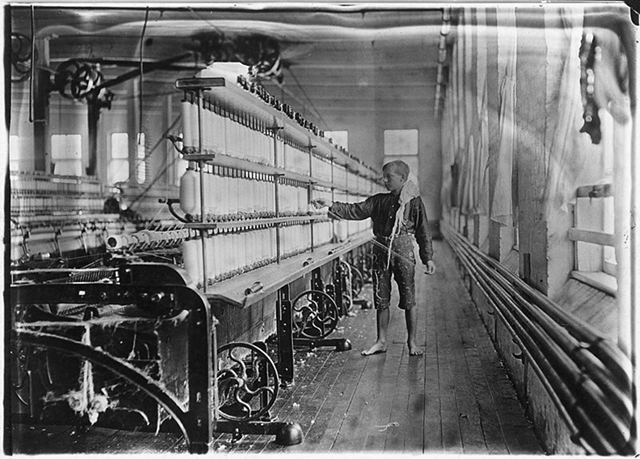 In earlier times workers in mills had to work in bare feet as the irons on their clogs could create sparks which could initiate a fire due to the floorboards being soaked with oil. Contact with these very oil soaked floorboards led to cases of foot cancer. And of course there was the dust. 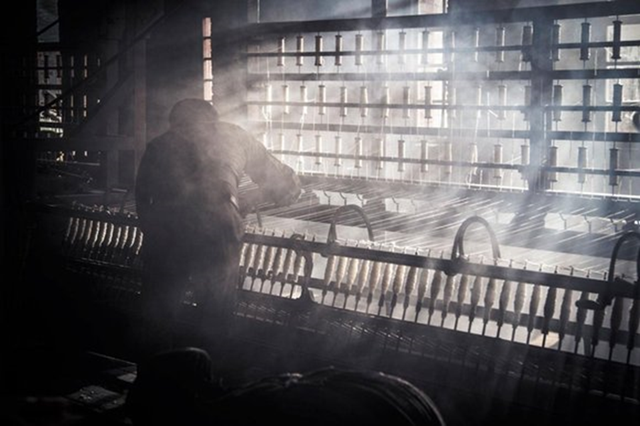 Exposure to cotton dust, particularly during early stages of production, can lead to the development of byssinosis – a debilitating respiratory disease. An allergic condition, it was often known as “Monday fever” as symptoms were worst on Mondays, easing off during the week. 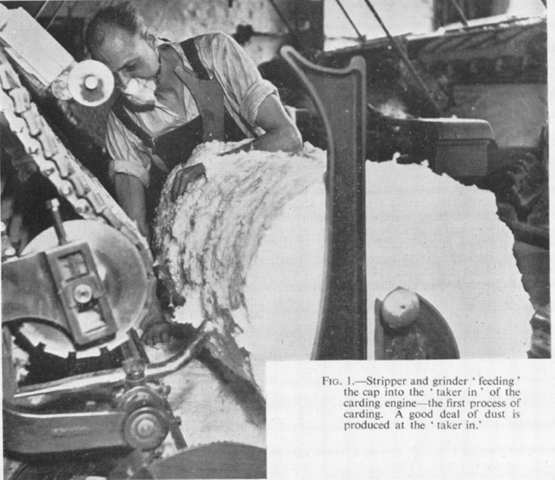 A study on 1909 reported that around 75% of mill workers suffered from respiratory disease. 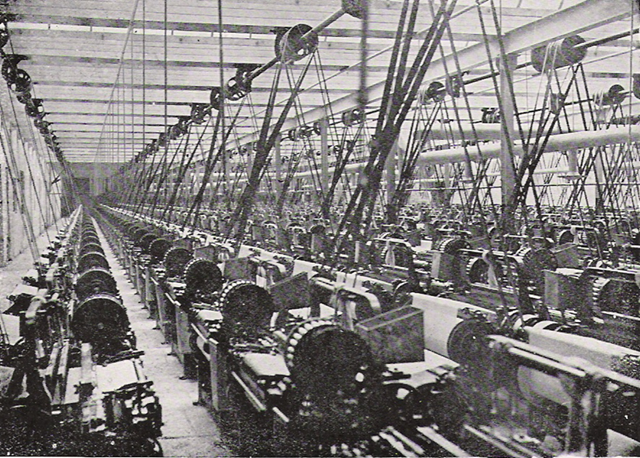 The worst areas for dust exposures were the carding rooms where the cotton was prepared ready for spinning, but dust levels could be high in spinning rooms too. Although control measures started to be introduced in the 1920’s workers continued to be exposed to dust levels that could cause byssinosis. Studies in the 1950’s showed than more than 60% of card room workers developed the disease as well as around 10 to 20% of workers in some spinning rooms. 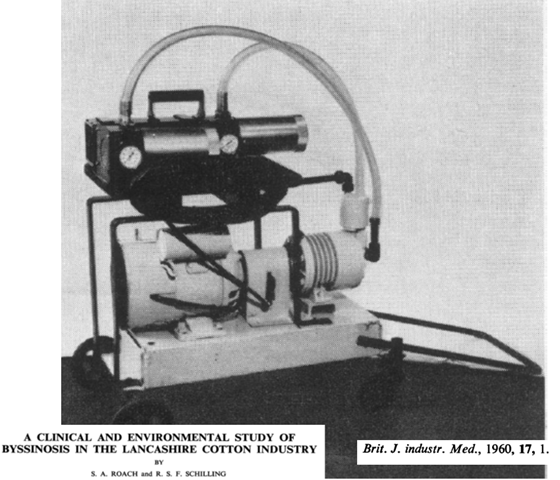 A lot of work was devoted to studying dust levels, developing standards and control measures by the early pioneers of occupational hygiene in the UK and I’m sure this contributed to improved conditions in the cotton industry in the UK. I’m not sure I’d like to have to operate their dust sampling kit though – it certainly wasn’t personal sampling! Today things are different. 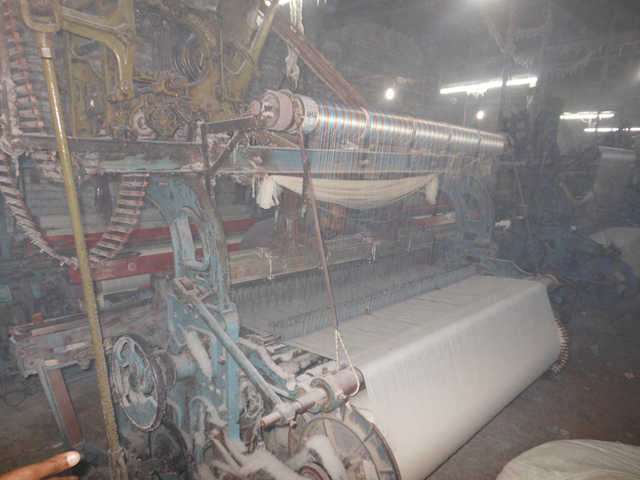 The carding machines, spinning frames and looms are silent and have been sent for scrap. The mills have been abandoned and are derelict or demolished or have been converted for other uses. 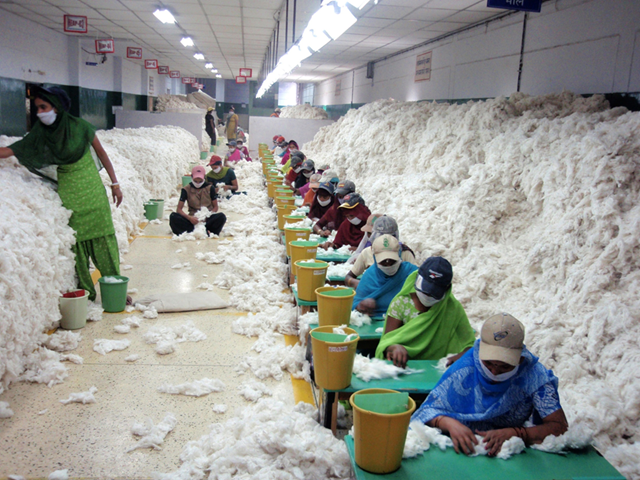 Cotton is still in demand but it’s a competitive market and the work has been moved to other countries where labour is cheap and standards are not as high – Africa, China and the Indian sub-continent. Another consequence of globalisation. Although you could say that the industry is returning to where it originated in the days before the industrial revolution. Sadly, conditions and working methods in many workplaces in the developing world are primitive and controls are minimal. It seems like the lessons learned in the 20th Century in the traditional economies are rarely applied so not surprisingly those traditional diseases associated with the industry are re-emerging in developing economies. 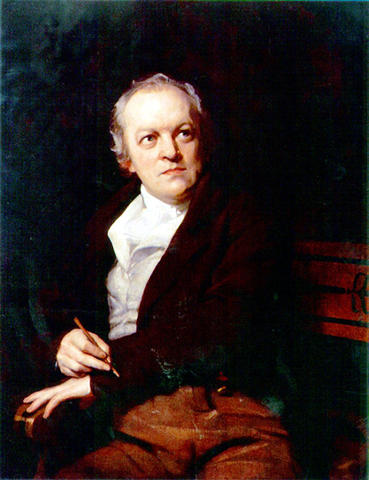 William Blake wrote of “Dark Satanic Mills” in 1804. This was still a fair description of the working conditions in Lancashire when my ancestors worked in the mills. And I believe its valid today in many workplaces in the developing world. Some occupational hygienists might take a dispassionate, academic interests in dust exposure. But I think most of us are motivated by a genuine desire to prevent ill health at work and improve working conditions. Many of us work in countries where conditions although far from perfect are relatively good. But can we turn a blind eye to what’s happening in the rest of the world? Personally, I think it’s something we need to be thinking about. This major group exhibition marking the Centenary of the First World War explores how artists have communicated the impact of military conflict on the body, mind, environment and human senses between 1914 and 2014. 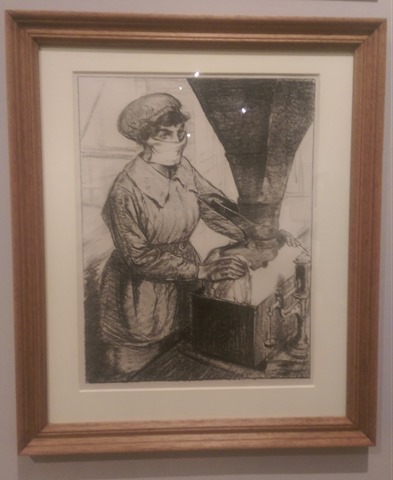 Included in the exhibition were a number of pictures illustrating the role of women on the “Home Front”. 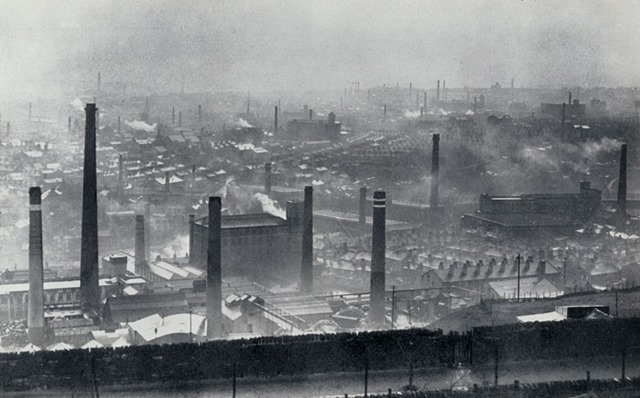 Due to sending many hundreds of thousands of young men to the trenches in Europe there was a shortage of workers to man the production lines in the munitions factories. The solution was to recruit women. This lithograph by Archibald Standish Hartrick, who worked as a war artist, shows a young woman filling shells with TNT explosive. The “munitionettes” were referred to as the “Canary Girls” as many of them developed yellow skin due to their exposure to the chemicals they were handling. TNT (2,4,6-Trinitrotoluene) as well as being highly explosive presents a number of serious health effects such as anemia (reduced number of red blood cells and reduced hemoglobin and hematocrit), liver function abnormalities, respiratory complications, and possibly aplastic anaemia (ASTDR). TNT can interact with haemoglobin to form methaemoglobin, reducing the capacity of the blood to carry oxygen and causing cyanosis – so it’s a chemical asphyxiant. It can also damage the liver, leading to jaundice and the yellow colour of the skin. Exposure can occur by inhalation of dust and also by skin absorption – both potentially significant for the worker portrayed in the picture. The control measures leave a lot to be desired with what appears to be direct hand contact and only the use of a primitive mask to control inhalation exposure with no evidence of any engineering controls. For King and Country (1916) by Edward F Skinner Source: Imperial War Museum – used under the terms of the IWM Non Commercial Licence. Conditions in munitions factories have improved considerably since the First World War and stringent control measures are implemented when TNT is handled. A UK Workplace Exposure Limit of 0.5 mg/m3 (8 hour time weighted average) has been established for 2,4,6-Trinitrotoluene. One of my colleagues undertook some sampling in a factory where 2,4,6-Trinitrotoluene was being handled recently. I’m glad to say that it was being controlled effectively and the airborne concentration was below the level of detection of the method. The future of occupational hygiene? Last week I was over at the American Industrial Hygiene Conference and Exhibition (AIHce) in San Antonio, Texas. It was my first time at this event and it was a great experience. This year is the 75th anniversary of the American Industrial Hygiene Association so this was an opportunity to look back on what the organisation has achieved. But they didn’t just rest on their laurels. it’s important to keep an eye on the future too, and this is what they did. Two of the keynotes in particular looked at what is happening in society and the world of Industrial/Occupational hygiene and at developments that are already starting to happen and which are likely to change the way we live and work in the not too distant future. He was optimistic that the “brightest minds” will use the available technologies such as new technologies such as bio tech, nano tech and clean tech industries, to bring innovation forward to solve global problems such as climate change. People will look back on our time period and say, "That’s when the world went digital, that’s when the world went global, and that’s when the world went sustainable" . Although he didn’t specifically address what was happening in industrial/occupational hygiene, or how these changes would directly affect it,his talk provided an overview of the context in which we are working and a lot of food for thought. Some of these ideas were developed the next morning in the Keynote by John Howard. He started by looking back at the development of the Industrial Hygiene profession in the USA and it’s achievements. He then went on to discuss the health effects of emerging manufacturing technologies and how technological innovations in sampling practices will change the profession over the next 75 years. There have been relatively few changes in how occupational hygienists have measured worker exposure to dust, vapours and other hazardous substances since the development of the personal sampling pump by Jerry Sherwood in the UK in 1957. However, Dr Howard suggested that developments in computer technology and miniaturisation could mean that exposure assessment in the near future could involve continuous sensing of the working environment and that it will be possible to directly monitor chemical loads in workers’ bodies and determine how those exposures have altered them. He suggested that personal direct-reading instruments may be developed that would allow workers to control their own exposures, and that occupational hygiene sampling could even evolve to incorporate the use of sensors that continuously send exposure data to a central database. 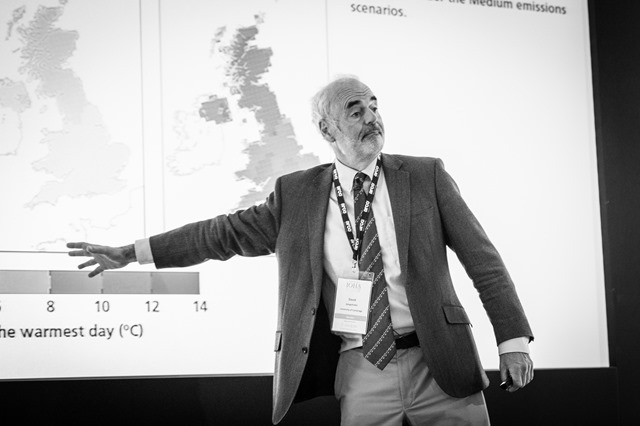 His predictions echoed a number of the points made by John Cherie at the British Occupational Hygiene Conference in Nottingham in March. He also suggested that relatively cheap sensors and monitors that connect to devices such as mobile phones, tablets and the Internet, that are already being developed (and in some cases are already available) would change the way that sampling and exposure assessment is carried out by occupational hygienists. These devices may be less accurate than the traditional sampling methods used to assess personal exposures. But this would be more than compensated for by the massive increase in the amount of data. I have no doubt that there will be major changes in exposure assessment methodologies in the future. The important thing to remember is that occupational hygiene is about protecting worker health and that understanding exposure is an important step towards ensuring that it is controlled and that we achieve a healthy working environment. Anything that improves the validity of what we do is to be welcomed. Exciting time ahead!